Must carry out their part. Who tears the cover off. In today’s installment of “Spring Training Is Way Better Than Sitting In A House Without Power During A Freak Snowstorm In March” … let’s head to Shreveport, Louisiana. See, Spring Training wasn’t always Grapefruits and Cactus. Georgia, South Carolina, Texas, and Alabama were all popular destinations in the early years of baseball. Teams just seemed to wander around. Back in early 20th century however, Spring Training was really just a time to get everyone back together, detox from the excesses of the off-season (mineral hot springs were especially popular), burn off winter weight, toss around a medicine ball, and try to get back into some sort of playing shape. 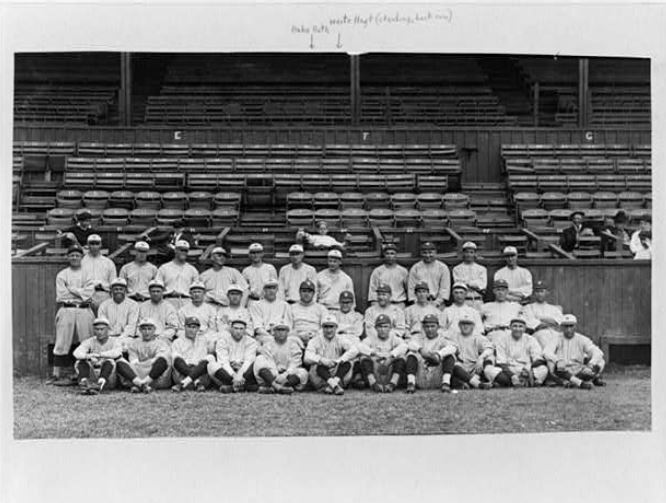 After a few rowdy Spring Trainings in Jacksonville, Florida (highlighted by more than a few “drunken orgies”), the Yankees moved their spring headquarters to Shreveport in 1921 because of its isolation (and because it was, ostensibly, a dry town). Safely away, they hoped, from the devilish temptations of booze, broads, and brawling. Shreveport – in the midst of its own crazy oil boom (and not very “dry” at all) – would be a place where Babe Ruth and the rest of the team could focus on baseball. Oh, did I not mention Babe? George Herman Ruth. Baltimore native. The man who bestowed one of the most successful and enduring curses on the Boston Red Sox. He did some other stuff too, hit some homers, changed the face of baseball, you know, that sort of thing, but I think I hit the high points. New York Yankees, Spring Training 1921. Babe Ruth is there in the center. 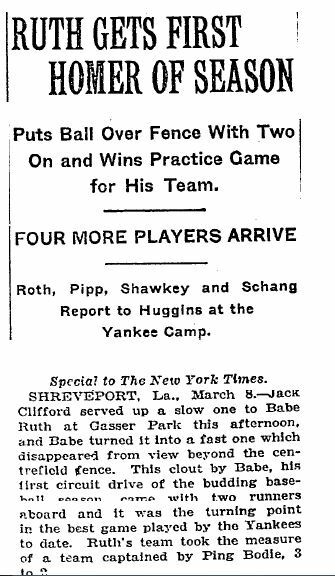 In his first practice at Shreveport’s Gasser Park in early March, it’s said that the Babe took his spot in batting practice and promptly crushed nine balls clear out of the park. Legend has it that he hit one ball 30 feet past the outfield fences – the longest home run ever in Gasser Park. You see, home runs were a pretty rare deal back then. These days, we see ‘em all the time. But, it was Babe who made them famous. Because there weren’t any other major league teams nearby to take on in Shreveport, the Yankees spent most of their Spring Training simply playing the minor league Shreveport Gassers. Over and over. I can find one report of the Gassers actually winning a game against the Yankees that spring. Generally, they lost. But, who cares, the locals just wanted to see the Babe. But one game stands out. On March 13, the Yankees pounded the Gassers 21-3. And, how did Babe do? It’s said that one of Babe’s home runs that day broke the window of a streetcar as it passed by. Although the Yankees lost the World Series that year to the New York Giants, the Babe hit 59 home runs, batting .378 (.846 slugging percentage). By mid-season he had his 139th career homer, a baseball record. So, yeh, he was pretty good. Ultimately, though, poor Shreveport proved to be a bit too far off the beaten track. Perhaps, a little too isolated, and not “dry” enough. The weather’s not all that great in Shreveport in March anyway. Highs in the 50s, lows often dip well below freezing. It’s not the best place to “warm up” one’s baseball bones. Still, if Babe Ruth is playing, I deem 1921 Shreveport as #5 on my top all-time Spring Training locations. And, far better than sitting in a cold, unpowered house during a freak Virginia snowstorm. #4 on the list … coming soon! There’s no professional baseball in Shreveport today. Which is a shame. The last pro team, the Shreveport-Bossier Captains of the Independent League, left in 2011. You’ll find them in Laredo, Texas now, where they’re called the Lemurs. This is Pancho el Lemur, the mascot of the Laredo Lemurs. Lemurs, by the way, are not native to Laredo. 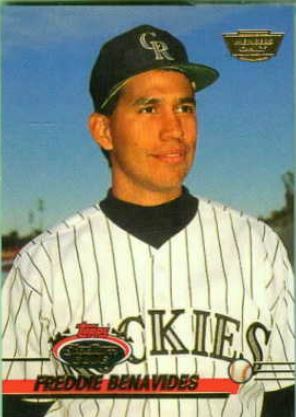 But, Freddie Benavides, who spent four years in the majors in the early 1990s, is. This entry was posted in Baseball, Baseball History and tagged Babe Ruth, Baltimore Orioles, Grantland Rice, mascots, NY Yankees, Oakland A's, spring training by Jackie, The Baseball Bloggess. Bookmark the permalink. Damn interesting post. I learned a lot, and I’ll be back for more. Thank you so much for reading. I love baseball and its rich history. And, I always love finding arcane little pockets of baseball history and lore that I didn’t know before. It’s so nice to have someone else who finds it interesting too! You may be forgiven for writing about the Yankees since Babe Ruth was, after all, a native of Baltimore. Stay warm, the snow is almost gone. Babe Ruth was born in Baltimore and was even — briefly — a Baltimore Oriole. So I give him a break for his Yankee-ness! I didn’t realize that the teams moved around for spring training. That was super cool to learn. And yes, Lusty Wallops is a great name for a stripper! My grandfather, Bruce Price, pitched for the Gassers that year and struck the Babe out twice. You don’t hear much about that.